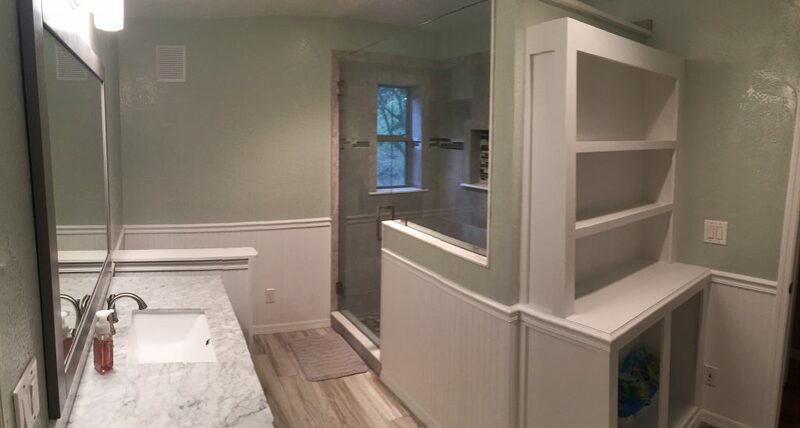 After a few grueling months of being without a bathroom, I am so excited to FINALLY share that my master bathroom remodel is complete! A two week project turned into 6-7 weeks. This is partly because my vanity went on back order (the beautiful vanity from Home Depot that I just could not live without!). 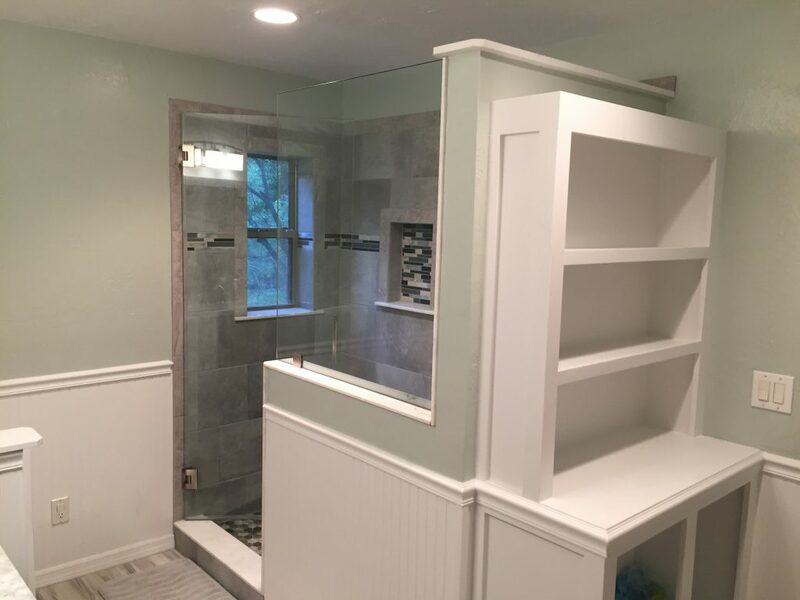 But mostly because we decided to go ahead and have our hardwood floors refinished in the midst of all of the bathroom remodel madness which slowed down the process. And then, to further complicate matters, I planned a small vacation smack dab in the middle of all of this. Needless to say, it has been a crazy few months and I wouldn’t want to live through it again. However, I am SO happy with how it turned out. Before I get ahead of myself, I want to show you what it looked like before. 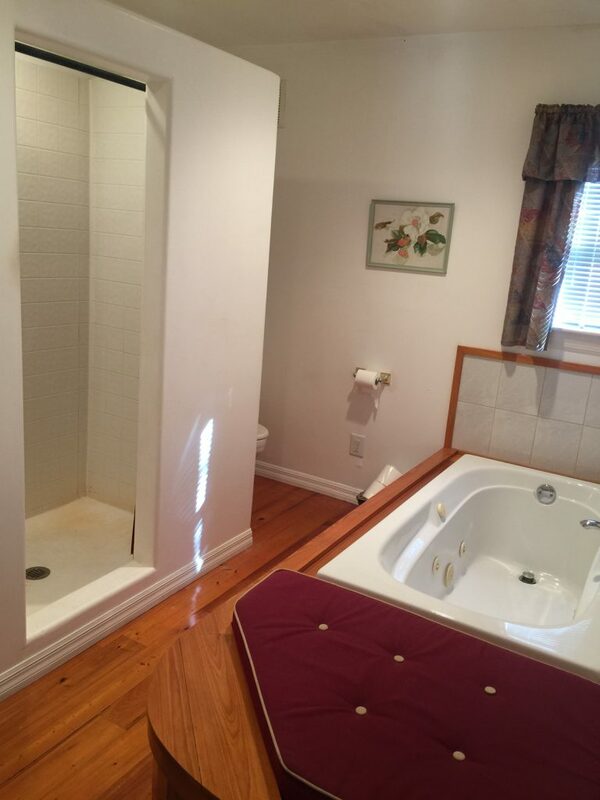 These pictures were taken when we viewed the house to buy it. You know my love for bathrooms so you can imagine my reaction when I first saw this bathroom almost one year ago. Let’s just say it was not love at first sight. In fact, it was almost a deal breaker for me buying the house altogether. And then my lovely husband threw in the deal that it could be our first remodel project and I was sold. Only it wasn’t. But that’s neither here nor there. It gone done eventually, right? Since we only have one full bathroom in the house it was a bit tricky. 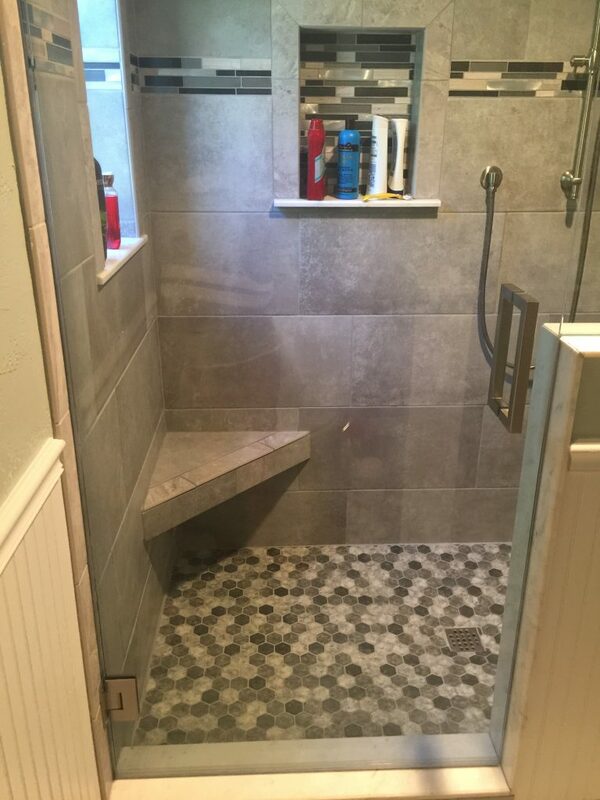 We decided to rip out the tub altogether (since it never got used anyways) and replace that with a big walk-in shower. 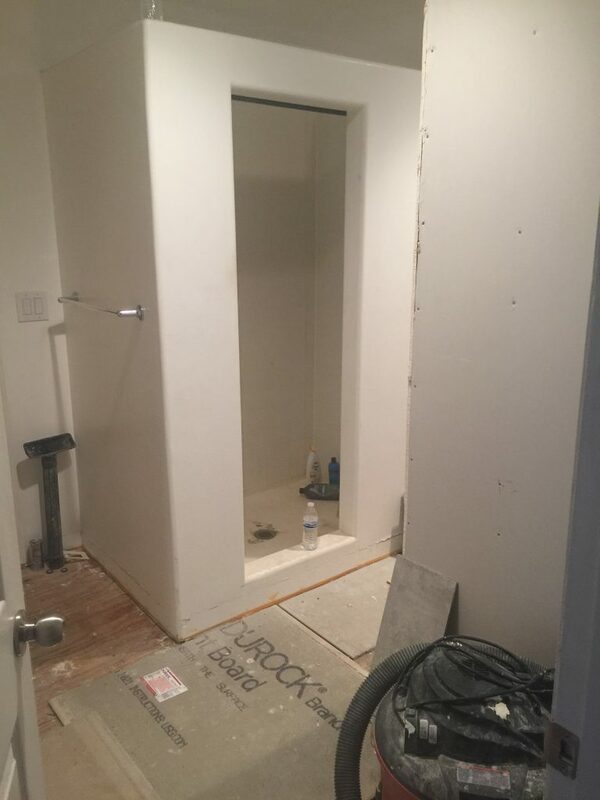 This would allow us to keep our shower in tact and continue to use it while the new shower was being built. It wasn’t until the last two weeks that hubby had to resort to showering in the great outdoors. I resorted to driving to good ole mom and dad’s house. And now for the big reveal….. I shopped around at tile from a few local tile suppliers, but the ones I settled on were from Home Depot. Not only did I like the selection better, but the price was almost half. 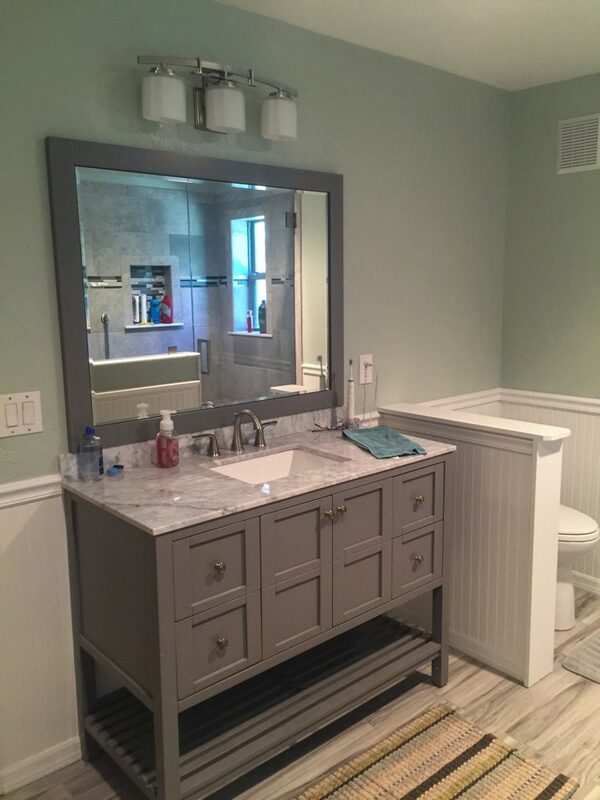 As I mention before, the vanity I ordered from Home Depot but I found it on several other sites for the same price. The reason I chose Home Depot was it was supposed to ship sooner. However, it ended up being about the same as others. The shower heads are by far my favorite part of the entire bathroom! 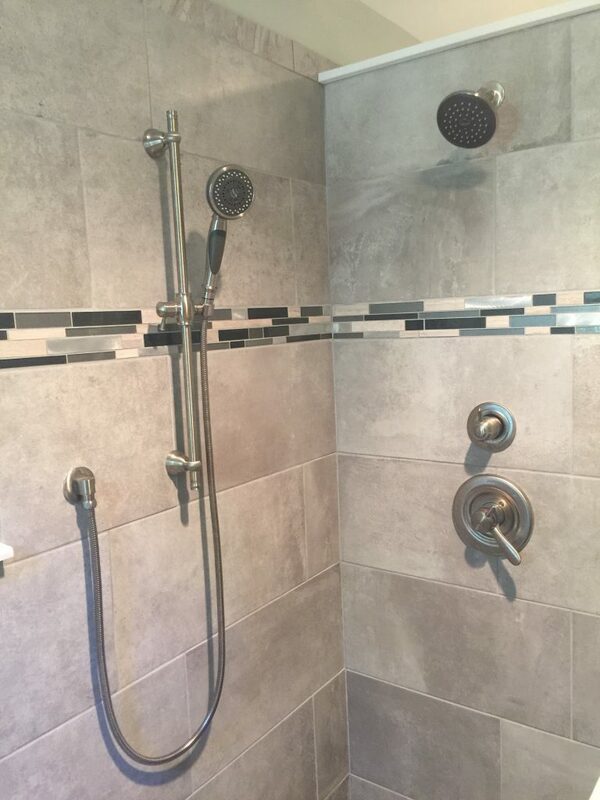 Thanks to my favorite plumber, my dad, he designed the shower for me and selected Delta Shower Heads. I have a Delta Rain Shower Head on one side. On the other is a Delta Handheld Shower Head with a slide bar similar to this one. With the diverter valve installed, I can use both shower heads simultaneously or flip back and forth between the two. Talk about the ultimate shower experience!!! 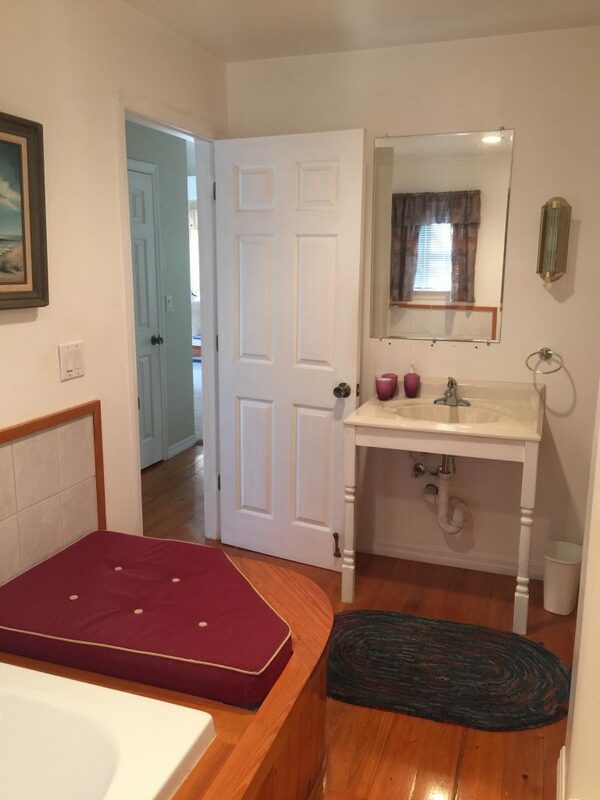 I also love the built-in shelf to hold shampoo and soap and, of course, the shower seat for shaving! One thing I hated before was the toilet being open to the bathroom. I always find it much more appealing to give the toilet a hint of privacy. 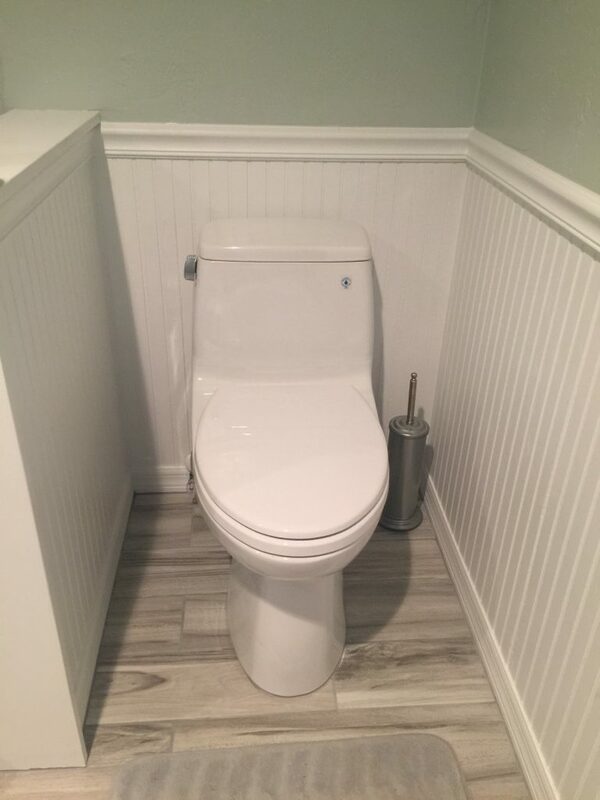 So we added the knee wall and replaced the toilet with a ToTo Ultramax II. I never thought I could love a toilet, but this one-piece toilet is so elegant looking. Also, the tornado flushing system is seriously amazing! Now that my bathroom is finally complete, the real decorating can begin!